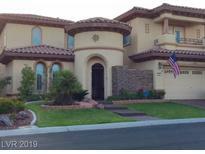 Below you can view all the homes for sale in the Monterossa Summerlin subdivision located in Las Vegas Nevada. Listings in Monterossa Summerlin are updated daily from data we receive from the Las Vegas multiple listing service. To learn more about any of these homes or to receive custom notifications when a new property is listed for sale in Monterossa Summerlin, give us a call at 702-930-8014. Remodeled Family Entertain Ctr. Back Yard Resort Feel. MLS#2083375. Property Depot. Backyard OASIS with SPARKLING BLUE POOL! Detached CASITA with full bathroom! MLS#2053758. Platinum R.E. Professionals. Open concept vaulted great room with views to back yard align with today's modern and desired floor plans. New sod just installed. MLS#2036650. HomeSmart Encore. These statistics are updated daily from the Greater Las Vegas Association of Realtors Multiple Listing Service. For further analysis or to obtain statistics not shown below please call EasyStreet Realty at 702-930-8014 and speak with one of our real estate consultants.